David Leman, chief HR officer, Middle East & Africa, Marriott International, outlines how the company is engaging Arab youth with training and development. Please tell us about Tahseen — what it is and what it does. The programme runs for the course of 12 to 18 months and provides the candidates with operational experience and theoretical training, empowering them with the knowledge, skills and experience to accelerate in leadership roles. In addition, participants also get hands-on experience through the Cornell e-learning platforms and the Cornell University-led development programme tailored specifically for the programme. We wanted to develop a programme that provides Arab youth, looking to lead successful careers in the hospitality industry, with ample opportunities to expand their knowledge and develop skills. We believe in developing talent in the markets where we operate and are specifically focused on increasing the number of nationals who are employed across our region. As such, we developed Tahseen in conjunction with Cornell University and supported by key partner DUR Hospitality. For the past couple of years, we have been working hard to create a paradigm shift on how hospitality is perceived as an industry by Arab nationals. 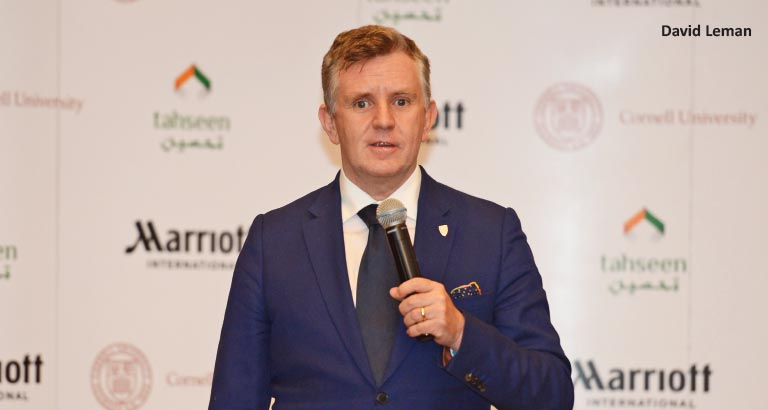 We have worked towards showcasing hospitality as a rewarding and fulfilling career option to the next generation of hoteliers while increasing brand awareness in individual markets within this region. With Tahseen, we saw an opportunity to play a more active role in recruiting, training and retaining these associates, by providing fulfilling career opportunities for growth and development in the region. What are the benefits for Tahseen graduates? Over the duration of the course, Tahseen graduates will be fully immersed into all aspects of the business with opportunities to learn and develop their skills and industry knowledge for managerial roles. The programme offered graduates six months of cross-exposure across all departments, as well as six to 12 months of departmental specialisation, led by a team of professional leaders across Marriott International’s participating hotels, as well as access to our world-renowned core management development programmes. All these learning options will help the graduates implement the knowledge in their future roles. Upon completion of the course, all participants received their Tahseen Diplomas as well as a Certificate in Hospitality Management from Cornell University. And, most importantly, they move into leadership positions in our hotels. I understand your first intake of students graduated in September last year, in Saudi Arabia. How many were in this batch and how has it affected their working lives so far? Last year, we had 30 graduates. All of them went through the development programme that focused on overall hotel knowledge, skill development in their department of choice and theoretical certification with Cornell University. After completing the programme, 28 out of the 30 were promoted to managerial positions in multiple departments such as food and beverage management and room operations including housekeeping. The latest intake began in January, how many are on this course and how were they chosen? Was the course oversubscribed? We had a lot of interest for Tahseen, both internally and externally. More so internally as our associates were able to see the success of their colleagues, understand the depth of knowledge gained from the programme and were inspired to receive the same opportunities and promotions. We have an evaluation process in place for each candidate. We conducted several assessment tests where each candidate was scored against specific criteria which helped us hand-pick candidates who best fit our profile for this programme. This year we have nearly 40 candidates from Saudi Arabia and Bahrain and we are looking forward to seeing this new batch make their own success stories with Tahseen. Are you taking students purely from Marriott properties, or can others participate? It is open for our internal associates as well as external candidates. As long as you have a passion for the hospitality industry you can be a part of Tahseen, even if you belong to an entirely different sector. For example, one of our candidates studied medicine and is now the assistant wedding manager at one of our hotels, while another studied human resources management or business administration and found their passion for food and beverage operations. We really have some inspiring career paths. Which is the most popular area of the hospitality sector for applicants? That’s hard to say as hospitality is a very diverse field that offers an array of career opportunities. It really depends on the preference of the candidates and which areas they would like to excel in. We have a large number of candidates that like sales, marketing, human resources or finance, but there are some that prefer culinary, food and beverage or rooms division. In general, most candidates love the guest interaction, be it B2B or B2C. We also bring new positions into the programme based on the candidates’ interests and, so, for this year’s batch we added engineering positions as well. I understand there are now plans to roll out the programme across the wider region. Can you outline the timeline for this? Following the success of the programme in Saudi Arabia, we launched Tahseen in Egypt, in partnership with Helwan University and Professional Development Foundation (PDF), last year in July. Now in our second year of Tahseen in KSA, we have extended the programme to Bahrain nationals looking to develop their careers in the hospitality industry. These individuals will join the programme in Saudi Arabia but also gain operational experience and training across the company’s hotels in Bahrain. I cannot specify where we will launch next, however we are looking to launch the programme across the wider region. As a company, we believe in putting people first. We are committed to giving our associates world-class training and opportunities to grow and be successful within the hospitality industry. A programme like Tahseen, that supports and builds national talent, imparts quality hospitality education in the region by opening doors of opportunity for the Arab youth. Tahseen falls under Marriott International’s new Sustainability and Social Impact Platform, Serve 360: Doing Good in Every Direction, which guides how the company makes a positive and sustainable impact wherever it does business. From empowerment opportunities to sustainable hotel development, the platform is designed to foster business growth while balancing the needs of associates, customers, owners, the environment and communities. One of the priority areas, or “coordinates”, of Serve 360 is Empower Through Opportunity. Tahseen is a programme that directly supports and brings this vision to life.